300,000 women were sterilized in the 1990s. Mobile phones and ancient Inca technology are coming together to enable survivors of forced sterilization to tell their stories and campaign for justice. Next year is likely to see a re-opening of the legal case concerning Peru’s scandalous sterilization of 300,000 women – many of them forced or without their informed consent. And the Quipu Living Documentary project – as the experimental communications initiative is called – could play a key role in helping the women achieve justice. The sterilizations took place in the 1990s, under the government of Alberto Fujimori. Survivors still have serious mental and physical problems as a result of the programme, which was supported by USAID. Poor and indigenous people were especially targeted. 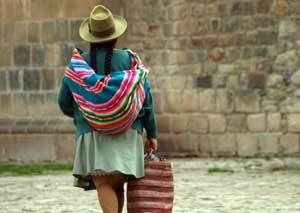 Many of the women are illiterate – which is where the Quipu project comes in. Combining low tech (mobile) phone and high-tech (VOIP) internet technology, survivors are able to record and listen to themselves and each other and to connect with the rest of the world. Some travelled up to eight hours to attend a pilot run of the project in Huancabamba, northern Peru. At first the women said they did not know how to tell their stories. But after a while their testimonies flowed. ‘The women were excited to hear their stories in their own voices. It was an affirmation,’ Karen Tucker, one of the project’s organizers, told a meeting of the Peru Support Group in London. The experience gives forced sterilization survivors practice in relating their experience which will be useful for court appearances and in the quest for collective compensation. Given the funding, the Quipu Living Documentary project – a collaboration between Chaka Studio and two Bristol university academics – will be extended to other parts of Peru. And where does the ancient Inca technology come in? The Quipu is an Inca communication system, made of knotted threads. The project named after it, is also a communication system making a collective string of oral histories, with the purpose of empowerment.